For as long as I can remember, I’ve always been a gold girl. From jewelry to hardware on handbags, I’ve always liked its contrast against the colours I wear and my skin tone. But change can be good, and things in my closet have definitely been changing: lately, the vast majority of what I’ve been purchasing seems to be silver, and its fresh and minimalist feel is definitely growing on me big time. How about you – are you a silver or gold kind of girl? Perfect look! You always put flawless looks together, love how the shoes add a very chic and a bit unexpected touch, and the bag, oh gosh! looooove it! Love the black & white in this! The bright bag adds an unexpected punch of color! That Zara jacket is absolutely perfect on you – glad you’re getting so much use out of it! Such a great look! Inspired me for a future post 😉 That necklace is so gorgeous too! Definitely a statement piece. I love that bright 3.1.Phillip Lim tote so much! I absolutely love your Phillip Lim bag! 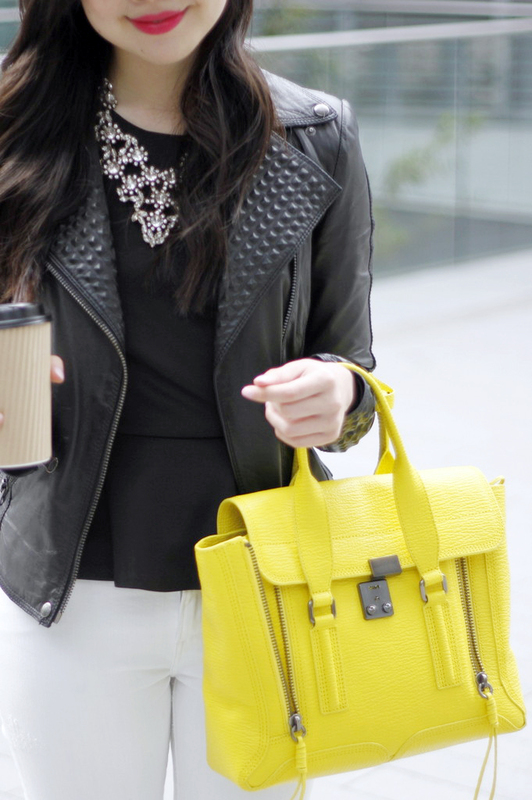 I also like the yellow bag – pop of color! 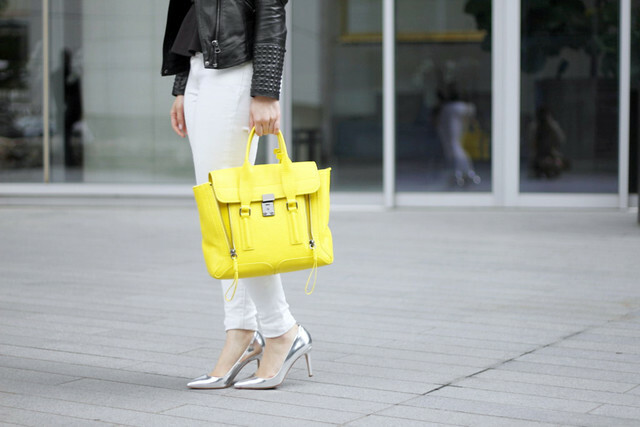 The yellow bag really puts the whole outfit together! Love it!! That bright bag is absolutely fabulous. i love the jacket! and the bag of course! I love this outfit! I love your shoes and bag! Gold. I’m a gold girl, but I have a few things in silver and I cannot deny the shiny, no-nonsense crystalline gleam of a silver chain or crystal encrusted silver necklace (like what you’ve got here). Silver to me, is more casual, especially if you’re a warmer skin tone (such as we are)… But it can be glitzy, too. Like Daytime Glam. Sort of the look you’re going for here! Of course, another On The Button look today. I’m actually the opposite! I went from being a silver girl (high school/college) to being a gold girl (post college). P.S. 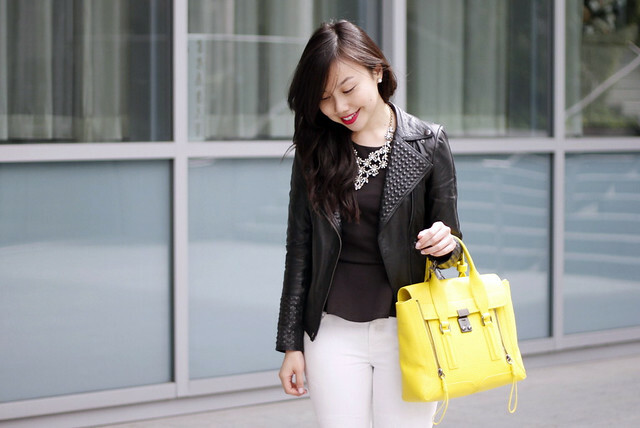 Love your new yellow Philip Lim bag with this outfit! Ohhh, those shoes! They are so high on my wishlist but also out of my current budget for a metallic silver pump. Sigh! They look amazing on you though & I’m so glad you got them! I’ve also always been a gold girl but am finding myself drawn to silver accessories more & more. I still find my issue with silver jewelry is that it feels too dainty & pretty, so I definitely find it more difficult finding silver jewels I like! But silver shoes & bags? Total love! I used to only be silver girl in high school, but as a grew older I became fond of gold. Now I love both metals and mixing the two together is quite fun too! Silver really suits you and oh my goodness, the debut of your Pashli! It’s a beauty.